Happy 2019! As my first post for the year I’m sharing this look I wore on New Year’s Eve. We had a small gathering at our home with my sisters and close friends. We all dressed up in sequins (including our kids and hubby’s) with nowhere to go but we had so much fun eating, dancing and letting the kids run wild with confetti. We will definitely make this a tradition for each NYE!!! I had sooo many questions about my NYE look from my IG stories I shared so I thought I would do an official outfit post for you ladies! I bought this skirt from Nordstrom with NYE in mind but the main reason I ended up buying it was that it’s a piece I’ll be able to wear throughout the year as well. My kids were also obsessed with moving the sequins up and down because they change color! Such a fun, playful and classic skirt!! Happy 2019, you look ABSOLUTELY BEAUTIFUL as always! That skirt is gorgeous! 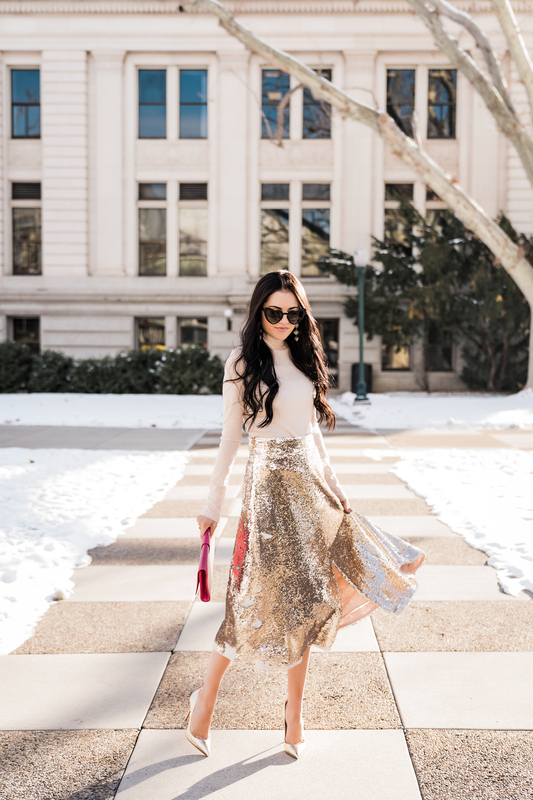 The Perfect NYE look! The sunglasses are YSL or not? Yes! They are style “LouLou Heart Shaped”. I’m in love with this look! The skirt especially is so beautiful and sparkly. So sophisticated! That skirt is everything! You look stunning! that skirt is absolutely everything! you look stunning! It’s a beautiful skirt. I’ve been wearing a lot of sequins lately and I always feel so festive when I do. You look lovely.